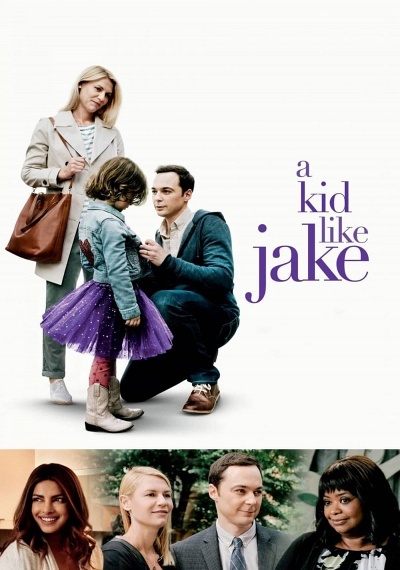 A Kid Like Jake :: Movie Information :: RabbitTV GO! Brooklyn parents Alex (Claire Danes) and Greg (Jim Parsons) are lucky to have a kid like Jake. Their four-year-old is bright, precocious, creative—and just happens to prefer Disney princesses to toy cars and skirts to jeans. Jake's 'gender expansive' behavior—as local preschool director Judy (Octavia Spencer) dubs it—is no big deal to Alex and Greg. Or so it seems, until the process of navigating New York City's hyper-competitive private school system opens up a parental quagmire: could Jake's gender nonconformity be just the thing that gives their child an edge in the admissions game? How young is too young to put a label on a child's identity? Is this just a phase, or is Jake truly transgender? Split in their opinions on how to handle the situation, Alex and Greg find themselves navigating an emotional and ethical minefield with one patch of common ground between them: their fierce desire to do what's right for Jake. Transparent director Silas Howard helms this timely, honest, emotionally rich look at 21st-century parenting.